Casa De Melo : Picolé-olé-olé-olé! 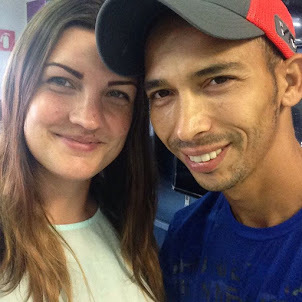 When we first moved here, my husband told me he had a lot of memories of walking around the business district with his father and being treated to picolé. Picolé is one of the things I'm really going to miss when we move back to the States. At any time I can walk out my door and find a vendor on our block. They're pretty low calorie (slightly less than a can of Coke), and since my kids have trouble putting on weight, it's the perfect snack for them. 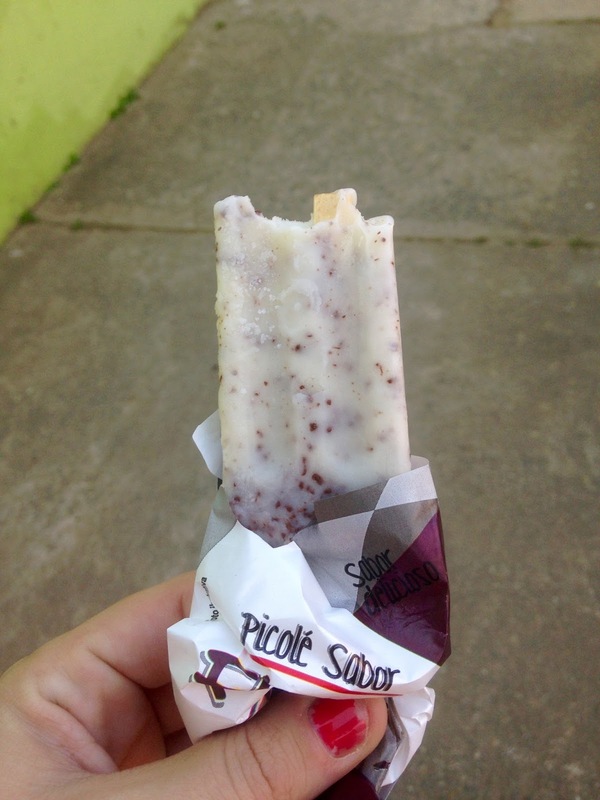 Picolé is a popsicle and it's one of my favorite things about Brazil. I know that sounds silly, but stick with me. We're in a desert state and it is hot hot HOT nine out of twelve months of the year. And our three month "winter" has us in the 70s and 80s (Fahrenheit) during the day. One time in the middle of the night I saw the temperature drop to 59F. Anyway, picolé is sold by vendors who walk around the city with two wheeled coolers full of the stuff. 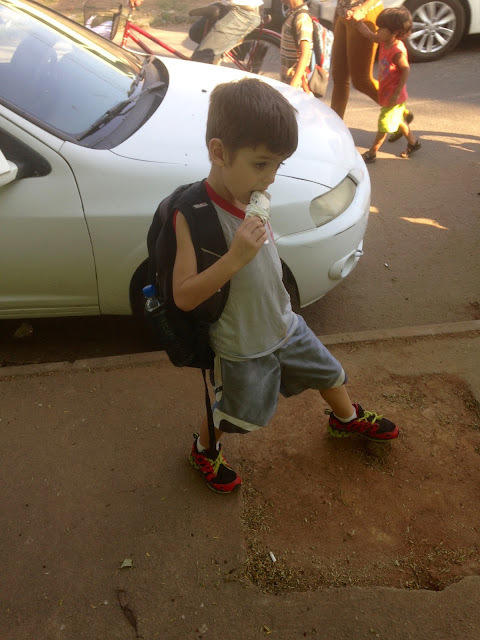 Cartons of ice cream are actually pretty expensive, but picolé is anywhere from R$1 to R$3, making it incredibly affordable. I'm sure our kids will also reminisce about picolé, because we buy it almost every day. It's a cheap e delicioso way to cool off: win-win. Picolé comes in a million strange and yummy flavors including: jabuticaba, lime, coconut, grape, pineapple, caju (the cashew fruit), strawberry, passion fruit, tangerine, orange, cherry, kiwi, mango, chocolate, guava, brigadeiro, yellow corn (you read that right), avocado, etc etc. 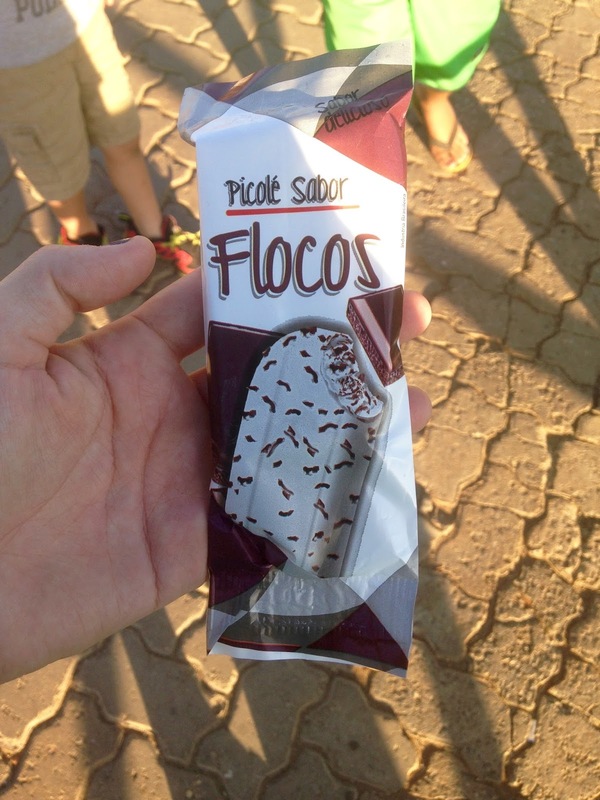 The family favorite is a flavor called "flocos." Flocos means flakes, which is appropriate, since it's vanilla ice cream with flakes of chocolate. Our favorite brand is Da Fruit but most vendors carry generic picolé. The cheaper versions have tiny specks of chocolate, but Da Milk has large chunks which makes it the winner for this chocolate loving family. 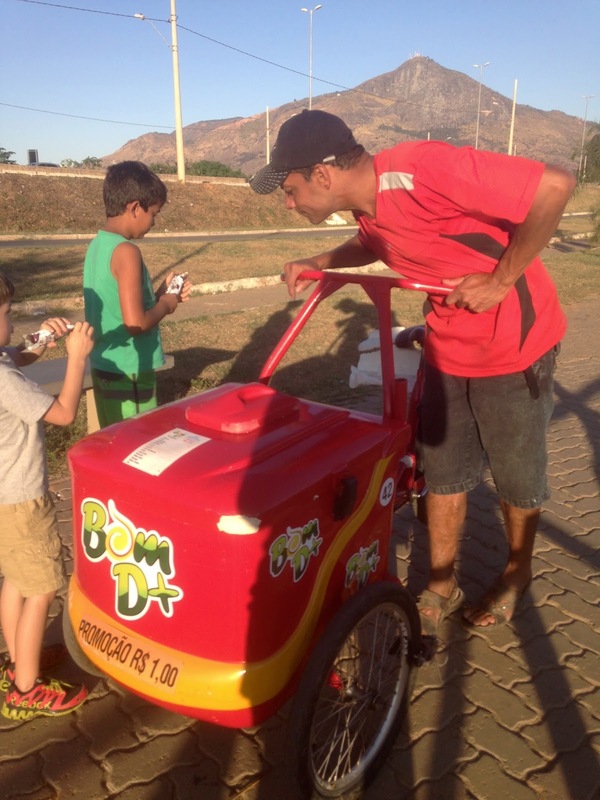 There are also "Mexican style" popsicles here - referred to as Paleta - that are very popular. Paleta means palette in English, so I'm not sure if there is a different connotation in Portuguese. My guess is that they were shooting for palate (as in sense of taste) or they were referring to the fact that paleta flavors are gourmet (which accounts for the R$8 price tag). Either way, there is a brand called Nu Paleta that we are very into. Our two favorite flavors are Nutella and brigadeiro. Both have a chocolate ice cream exterior with a gooey chocolately filling. And the brigadeiro flavor has sprinkles on the outside - as the brigadeiro dessert traditionally has. 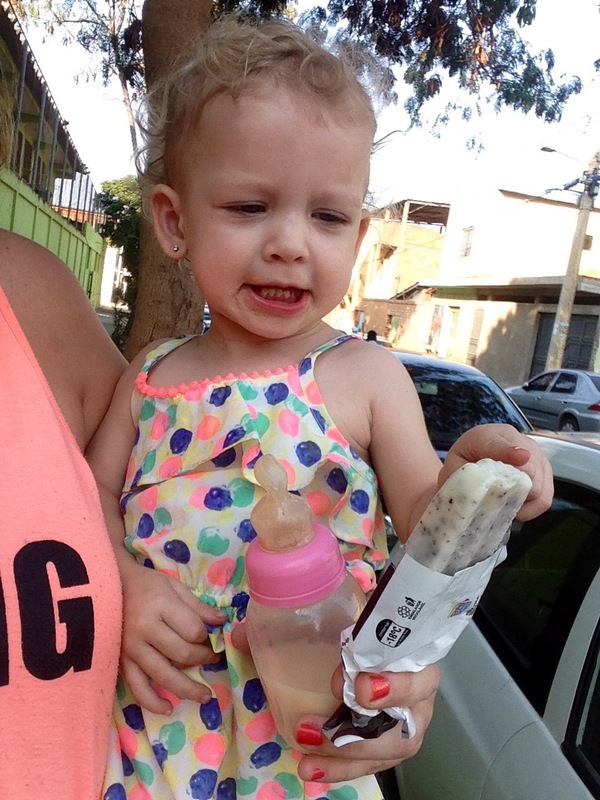 Paleta is sold in ice cream stores and at mall kiosks - you won't find vendors walking around with it in their coolers. 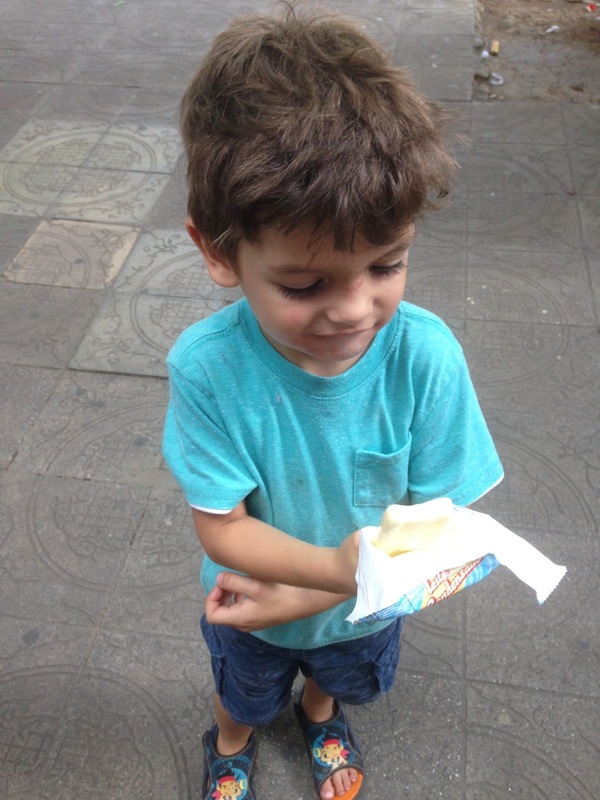 Because it's so expensive, we order paleta only as a special treat. (A hamburger is R$6.50 for comparison). But if I could afford the calories or the price tag, I'd have one every day. If you're not sure how hot it is - look at that hair! My kids have trouble putting on weight too (it must be the heat), but I don't. So I make them picolé at home. It's very easy (I have the molds and I make them with gelatina) and since I have the exact amount of picolé per kid ratio, I don´t have the temptation to eat them myself! :) (my favorite is leite condensado).